The position of non-Muslims living under Islamic rule (dhimmi) is a widely misunderstood topic. Those wishing to attack Islam and its systems portray Islam’s treatment of the dhimmi as worse than its treatment of animals. Historical incidents where dhimmi suffered persecution at particular times are generalised and quoted out of context in order to back up their claims. To answer this accusation that dhimmi are second-class citizens who will have a miserable existence living in a future Khilafah we need to look at Islam’s view on citizenship and how it applies to non-Muslims. Citizenship in Islam is based on someone permanently living within the lands of the Khilafah regardless of their ethnicity or creed. It is not a requirement for someone to become Muslim and adopt the values of Islam in order to become a citizen of the state. Muslims living outside the Islamic State do not enjoy the rights of citizenship, whereas a non-Muslim living permanently within the Islamic State (dar ul-Islam) does. This is derived from the following hadith. However, there are exceptions to this. If the Shari’ah rule is dependent on belief in Islam such as praying salah or giving the zakat tax then it applies only to Muslims. These exceptions are not discriminatory rules as some have claimed, but take in to account the beliefs and values of the citizen so as not to cause oppression to them. They in no way detract from being equal citizens. When discussing the rights and responsibilities of the dhimmi in this article these for the most part apply equally to both the Mu’ahid and the Must’amin. The exceptions are in the specific terms of the treaties and visa applications adopted by the Khaleefah. 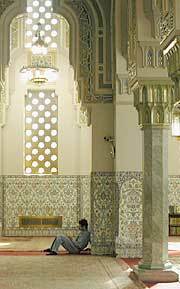 The state makes a pledge to treat the dhimmi in accordance with the specific terms of the peace treaty made with them (if applicable) and not to interfere in their beliefs, worships and those actions that contradict Islam but were permitted to the dhimmi by the Messenger of Allah (saw) such as drinking alcohol. In all other areas they are viewed and treated in the same way as Muslims unless belief in Islam is a condition for the action. There are many ahadith ordering good treatment of the dhimmi and not abusing them or treating them as second-class citizens. One of the accusations against Islam’s treatment of dhimmi is that a dhimmi is not allowed to give evidence against a Muslim and his oath is not acceptable in an Islamic court. The rule of law applies to everyone within the Khilafah and there are no exceptions. It is obligatory for the Islamic State to judge in cases concerning the dhimmi with justice and no discrimination against them is allowed. And if you judge, judge with justice between them. The most famous example of this justice is in the legal trial of a Jew who stole the coat of armour of Imam Ali (ra) as he was travelling to a battle. The judge Shurayh made no exception for Ali (ra) even though he was the Khaleefah, a Muslim and also off to fight in a battle so was in desperate need of his armour. Shurayh ruled in favour of the Jew and accepted his testimony in court. Full details of the trial can be read here. It may be claimed that the condition of ‘Adl applies only to Muslims who refrain from committing the kabeera (major) sins. This is incorrect. ‘Adl in this context means someone who abstains from that which the people consider a violation of uprightness, whether he was a Muslim or non-Muslim. This is because ‘adaala (trustworthiness) was stipulated in the testimony of the Muslim as well as in the testimony of the non-Muslim, by using the same word without distinguishing one from the other. Again this is a false accusation. Punishments for crimes are applied equally to both Muslims and dhimmi with no distinction. The only distinction is that dhimmi will not be punished for those actions which are permitted for them such as drinking alcohol, whereas a Muslim would be. This hadith clearly indicates that if a Muslim kills a mu’ahid he is punished with death.21 This equally applies to the killing of a dhimmi as discussed earlier. The dhimmi enjoy the same economic benefits as Muslims. They can be employees, establish companies, be partners with Muslims and buy and sell goods. Their wealth is protected and if they are poor and unable to find work they are entitled to state benefits from the Khilafah’s Treasury (Bait ul-Mal). Historically, many dhimmi prospered within the lands of the Khilafah. The poor dhimmi will receive state benefits if they are in need. With regards taxation the shari’ah has put the condition of belief on some of the taxes, which means they are applied differently between the Muslims and dhimmi. Muslims for example are ordered to pay the Zakat but dhimmi are exempt, whereas dhimmi are ordered to pay the jizya (head tax) but Muslims are exempt. The obligation of the jizya is derived from the following verse of the Qur’an. The jizya is applied according to the prosperity of the dhimmi. In the time of ‘Umar ibn al-Khattab (ra) he established three different bands of jizya depending on the prosperity of the person. The jizya rates for different provinces (wiliyat) of the Khilafah in the time of ‘Umar ibn al-Khattab (ra) are shown below. It is forbidden for the Khilafah to overburden the dhimmi with heavy taxation. When collecting the jizya this cannot be collected by abusing and torturing the dhimmi as some have claimed. With regards the Kharaj (agricultural land tax) this applies equally to Muslims and dhimmi with no distinction. Muslim and dhimmi communities live together, side by side in the Khilafah. They are not persecuted, hated and forced to live in fear by the Muslims. The dhimmi neighbours have the same rights as Muslim neighbours with no distinction. Muslims and dhimmi will visit each other, be courteous and socialise together. The Messenger of Allah (saw) used to visit the poorly from amongst the dhimmi. Thomas Arnold describes the relations between dhimmi and Muslim communities in Spain under Islamic rule. Another accusation is that dhimmi cannot be civil servants within the Khilafah or be members of the government. It’s true that a dhimmi cannot hold any ruling position within the Khilafah. This is because the Shari’ah has restricted these positions to those who believe in the ideology of the state i.e. Islam. This is no different to any ideological state within the world today. Having said this dhimmi can be civil servants and directors of the administrative government departments. Discrimination against dhimmi for civil service posts is forbidden. The evidence for this is from the Islamic rules on hiring (Ijara) where it is permitted to hire any person whether Muslim or non-Muslim. This is because the evidences for hiring came in a general form. The Messenger of Allah (saw) himself once hired a man from the tribe Banu Ad-Deel who was a non-Muslim, which indicates that it is permitted to hire a non-Muslim just as it is to hire a Muslim. Although dhimmi cannot hold ruling positions within the government this does not mean they cannot politically participate within the Khilafah. One of the pillars of the Islamic ruling system is consultation (shura). This function is institutionalised within an elected council called the Majlis al-Ummah (Council of the Ummah) that forms part of the Khilafah government. The Majlis al-Ummah is an elected council whose members can be Muslim, non-Muslim, men or women. These members represent the interests of their constituencies within the state. The majlis has no powers of legislation like in a democratic parliament but it does have many powers that act as a counterbalance to the executive powers of the Khaleefah. A widespread accusation against the Khilafah is that Islam was spread by the sword forcing non-Muslims to convert to Islam or die. This claim in particular is used to create fear and opposition within western countries to the re-emergence of a Khilafah in the Muslim world. Islam categorically forbids forcing anyone to convert to Islam. Islam has also forbidden tempting non-Muslims away from their beliefs and worships. The dhimmi places of worship are also protected by the Khilafah. The existence of centuries old Churches, Synagogues and Temples throughout the Muslim world is clear evidence to this fact. Since these areas are the only areas a religion such as Christianity, Judaism or Hinduism has detailed rules for, the dhimmi will generally face no conflicts between their religions and living within the Khilafah. The dhimmi are citizens of the Khilafah and enjoy all the rights of citizenship such as protection, guaranteed living and fair treatment. They also enjoy the right of being treated with kindness, leniency, justice and clemency. They can join the Islamic armed forces and fight alongside the Muslims if they choose to do so, but they are not obliged to fight as the Muslims are. They are viewed by the ruler and the judge in the same light as the Muslims are viewed without any discrimination in terms of managing their affairs and when implementing the rules of transactions (mu’amilat) and the penal code (hudud) upon them. Assalam alykom bros this is a great article. You mentioned that the Mejlis-L-Umma consists of members who are elected. Please could please publish an article on this website elaborating on how elections in the caliphate will look like. Will it be something like a western style election campaign with a secret ballot of one person-one vote, where all the candidates boast of how amazing they are? Are the election candidates in the caliphate allowed to fund their election campaigns from 3rd party lobbyists and wealthy donors like what happens in the west. We would love to know because these western “democratic elections” are the only style of peoples-participation-in-governance that most of us who are brought up in the west have ever heard of. There are many people who are searching for or trying to develop alternative ways of governance but they all fail.